MOST ACTION PACKED ARCADE ON THE APP STORE! Cute? Maybe. Fast? Sure! Action-packed? You bet. Crazy? You won’t believe your eyes! Laser Kitty Pow Pow is fast paced, arcade-like, laser infused, crystal boosted, ninja exploding and kitty flying game that challenges the definition of ARCADE ACTION on the App Store. Are you ready? Face more enemies than the highest number you know. Enjoy fast, easy to jump in and crazy satisfying action. Unlock, use and upgrade special Cat-laser powers. Meet Tim the Tailor and craft super cute and powerful Cats. Play adaptive challenge system and face new enemies at your own pace. Lose yourself in sensory-overloading retro visual style. 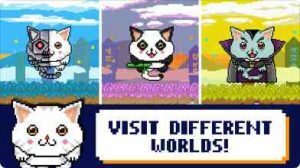 Get your favourite Kitty and defend the world against evil! I’ve never left a review on a game before but this game deserves every star. Not only is a great time killer, the overall concept is great. You don’t need to spend actual money because you get a good amount of coins from the game itself. The only downside is how laggy it gets when you use too many powers at once. It only happens once in a while though. But great job developers! I’ve been looking for a hard, but entertaining, game for years! This is the first one I’ve found, and I’ve been playing it ever since. The soundtrack is pretty calming too! But sometimes it gets kinda repetitive with the side to side fighting.